Cut the paner into cubes. Mix together the cottage cheese, 1 tsp salt, egg, corn flour, garlic, ginger and water to just coat the paneer pieces with the mixture. Heat oil in a pan and fry the paneer pieces caoted with mixture till golden in color. Heat 2 tbsp of the oil in a wok and stir fry the onions in it over high heat for half a minute. 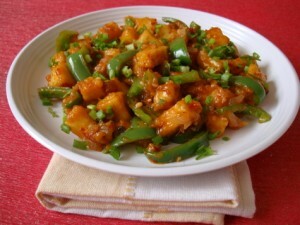 Add the green chillies, salt, soya sauce, vinegar, ajinomoto and the fried paneer cubes. Mix well, and garnish the chilli paneer with finely cut spring onions and coriander.